Here at the Margaret Sanger Papers Project, we’re no strangers to misquotes, misinterpretations, and all sorts of other misinformation about Sanger. It often originates from anti-abortion proponents deliberately attempting to discredit Sanger and, by extension, Planned Parenthood. Just do a search through Twitter for Margaret Sanger, and you’ll likely find one particularly sloppy Photoshopped picture of her speaking to a group of KKK members. Deliberate misinformation is common–but it is also fairly easy to misunderstand or overly simplify Sanger’s intentions by relying highly interpretive secondary sources. Recently brought to our attention was a book containing a section on eugenics that mentions Sanger—titled Against Their Will:The Secret History of Medical Experimentation on Children in Cold War America by Allen M. Hornblum, Judith Lynn Newman, and Gregory J. Dober (2013). You would not expect to find Margaret Sanger mentioned in this sad history, but she does turn up in the overview of the eugenics movement that opens the book. Now, it’s true that Margaret Sanger believed in eugenics, though she despised the eugenics of the Nazis and other extremists. But I found these quotes unlikely words of Sanger, so I dug through the notes to find the source. Sure enough, the quotes come from a secondary source—Edwin Black’s War Against The Weak: Eugenics and America’s Campaign to Create a Master Race (2003). Black did read primary sources–chiefly Sanger’s 1922 The Pivot of Civilization, and determined that Sanger was so anti-charity that she encouraged leaving those in need to die. The poor woman is taught how to have her seventh child, when what she wants to know is how to avoid bringing into the world her eighth. (Pivot of Civilization, 116). Sanger’s writings were certainly eugenic and not always particularly kind towards those she referred to as “unfit”. However, that she called for the end of philanthropy, thought “it was better that the cold and hungry be left without help”, and was a supporter of “extermination” of the poor and disabled are definitely Black’s interpretation of her work and not quotes from Sanger. The authors of Against Their Will—rather than using Sanger’s words—make assumptions based on a secondary source, one with an interpretation of Sanger that not everyone agrees with. Don’t believe me? I highly encourage you to create your own analysis by skipping the secondary sources, and reading Sanger’s writings for yourself. For a more comprehensive look at Sanger’s complicated relationship with eugenics, search the Speeches and Articles of Margaret Sanger. We are pleased to announce that the Margaret Sanger Papers Project’s website has been primped and updated just in time for Women’s History Month! Thanks to the hard work of our former editorial assistant Angela Wu (NYU 2013), and a University of Michigan intern, Sabarish Raghupathy, the site has a new look that we hope will take us through to the project’s completion. We invite you to explore the site and let us know how you like it. Is there any reason why women should not receive clean, harmless, scientific knowledge on how to prevent conception? The women of the upper middle-class have all available knowledge and implements to prevent conception. The woman of the lower-middle class is struggling for this knowledge. She tries various methods of prevention, and after a few years of experience plus medical advice succeeds in discovering some method, suitable to her individual self. The woman of the people is the only one left in ignorance of this information. The Woman Rebel was just the beginning of Sanger’s life-long campaign to make birth control available to every woman. One hundred years after the Woman Rebel screeched its way into the public consciousness, the victories that Margaret Sanger fought so hard for are being challenged once again. We see it most in a war over how Margaret Sanger should be portrayed, with ahistorical treatments commonly found on blogs and other websites. The Sanger Project’s goal is to make her own words accessible to the broadest possible audience. Margaret Sanger was a complex historical figure, and whether you like or loathe her, her efforts shaped the 20th century by empowering women to take control of their reproductive lives and to devise a plan to fit childbearing in along with other life goals. What better way is there than to spend Women’s History Month learning about a true Woman Rebel, Margaret Sanger? Our first three volumes are out and available. And if you have the means, please consider supporting the work of the Margaret Sanger Papers. We are working to finish up Volume 4, and are mounting and proofreading over 1,000 texts to the Speeches and Articles of Margaret Sanger. This digital archive is free to the public and contains one copy of all extant Sanger speeches and short-form publications. Have a Happy Women’s History Month– and don’t feel the need to stop celebrating when April rolls around! For the complete text of the 100 year old “The Aim” and “The Prevention of Conception,” see our digital edition. 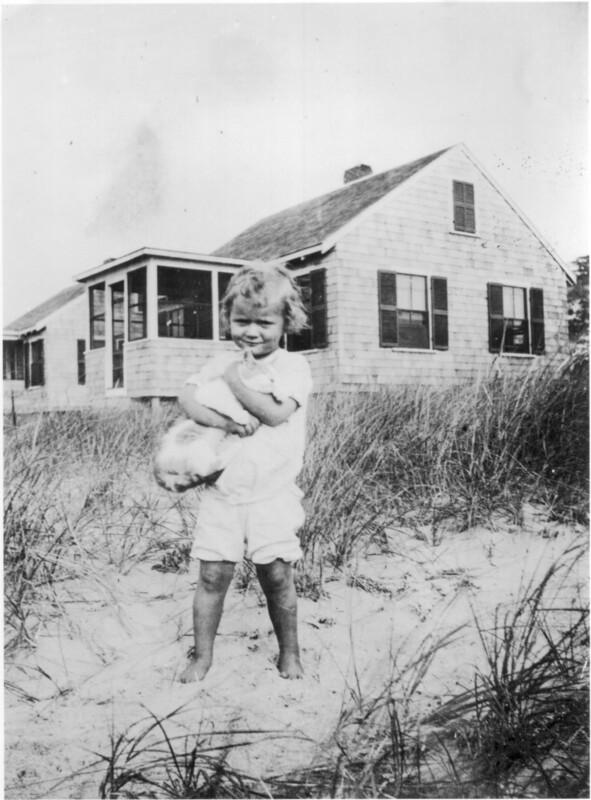 Peggy Sanger on the beach in Massachusetts with the cat, Truro, summer 1913. Margaret Sanger longed for a daughter after the birth of her two sons. She wrote in her Autobiography, “I yearned especially for a daughter, and twenty months later my wish came true.” Peggy, who was born on May 31, 1910, “was so satisfactory a baby” that Margaret was not disappointed when the doctor told her that, due to her illness, she could not have any more children. Peggy contracted polio in 1913 but survived, although her left leg was permanently affected. faced the Bay, and when the tide was high the water came up and lapped at the piles on which the cottage was built. Stuart, Grant, and Peggy used to sit on the steps and dabble their toes. At low tide they had two miles of beach on which to skip and run; it was a wonderful place to play, and all summer we had sunrise breakfasts, sunset picnics. The Jardin du Luxembourg in Paris today. 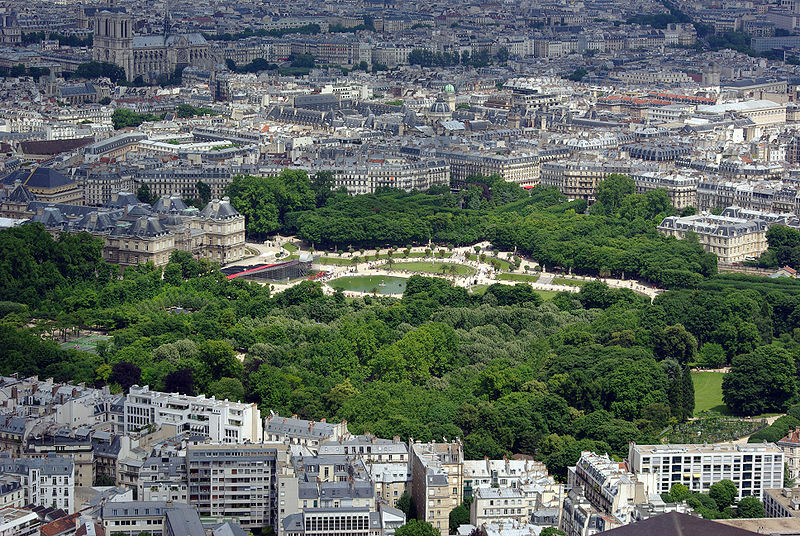 Later that year, during the family’s trip to Europe, they sublet an apartment on the Boulevard St. Michel across from the Luxembourg Gardens, “where Grant and Peggy could play” — and what a playground that would be! Peggy, who had never seen a derby before, took possession of their hats and sticks, and in the hall a little parade of children formed, marching up and down in front of the door. One of the gentlemen was so furious that I hid Peggy in the kitchen away from his wrath. In 1947, Sanger was named the “Ideal American Mother” by the League of American Womanhood, and it is easy to see why when one considers the amount of concern she had for her children. Even caught up in all the drama surrounding her publication of The Woman Rebel, she could not postpone certain things, “the most important among them being to provide for the children’s future… temporarily, I sent the younger two to the Catskills and Stuart to a camp in Maine,” while she made provisions for their schooling for the next year on Long Island. 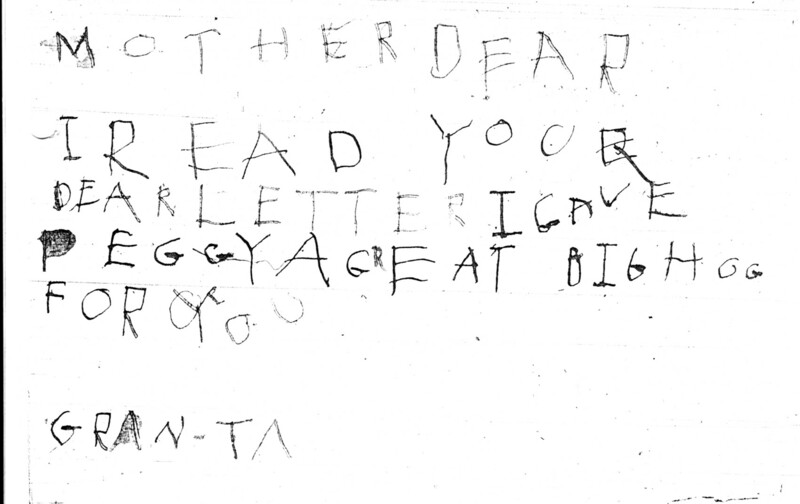 A undated 1914 letter from Grant Sanger to his mother; he gave Peggy a ‘great big hug’ on Margaret’s behalf. 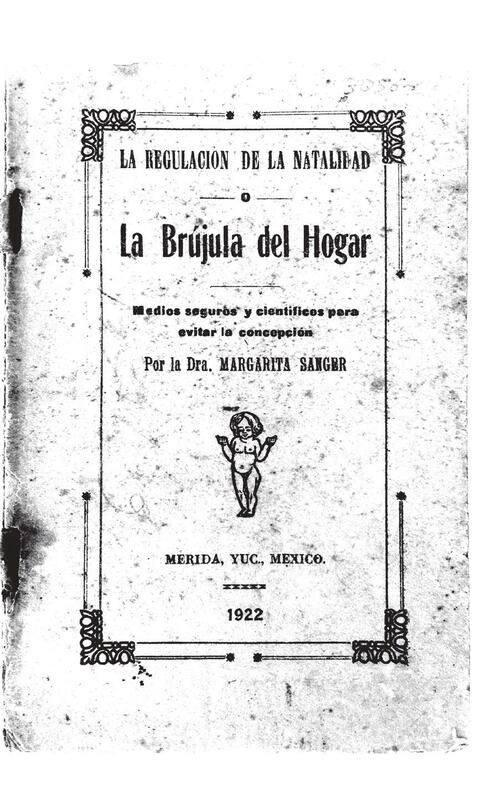 All of her problems related to The Woman Rebel and the impending trial were “suddenly swept aside by a crisis of a more intimate nature, a tragedy about which I find myself still unable to write, though so many years have passed.” Her Autobiography was first published in 1938, 23 years after Peggy’s untimely death. 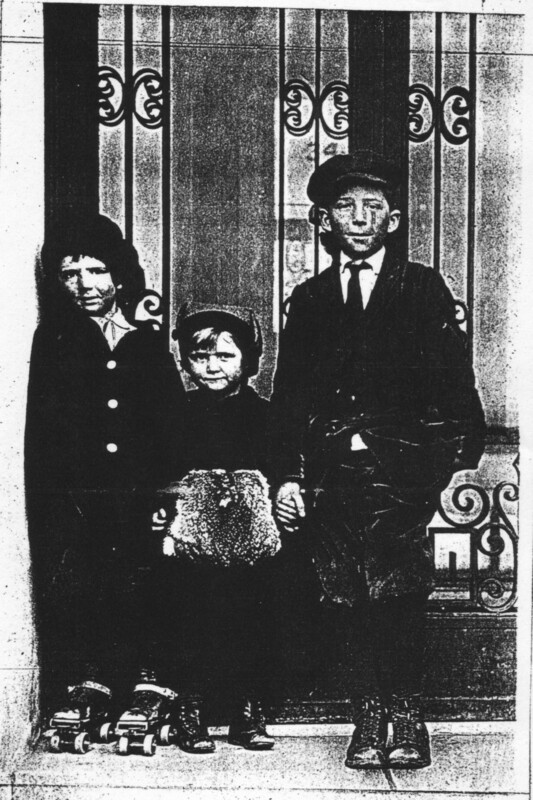 An undated photo of the three Sanger children — Grant, Peggy, and Stuart. the joy in the fullness of life went out of it then and has never quite returned. Deep in the hidden realm of my consciousness my little girl has continued to live, and in that strange, mysterious place where reality and imagination meet, she has grown up to womanhood. There she leads an ideal existence untouched by harsh actuality and disillusion. Men and women from all classes, from nearly ever city in America, poured upon me their sympathy. Money for my trial came beyond my understanding… women wrote of children dead a quarter of a century for whom they were still secretly mourning, and sent me pictures and locks of hair of their own dead babies. I had never fully realized until then that the loss of a child remains unforgotten to every mother during her lifetime. I really think it is impardonable on your part to blame yourself for the death of Peggy. I am sure that it is due only to your depressed state of mind as I cannot imagine anyone with your intelligence to hold herself responsible for something that could not possibly have been in your power… Please, dear, don’t think me heartless. I feel deeply with your loss but I also feel that you owe it to yourself and the work you have before you to collect your strength. After all dear, it is a thing which has passed and cannot be redeemed whereas you need your vitality. 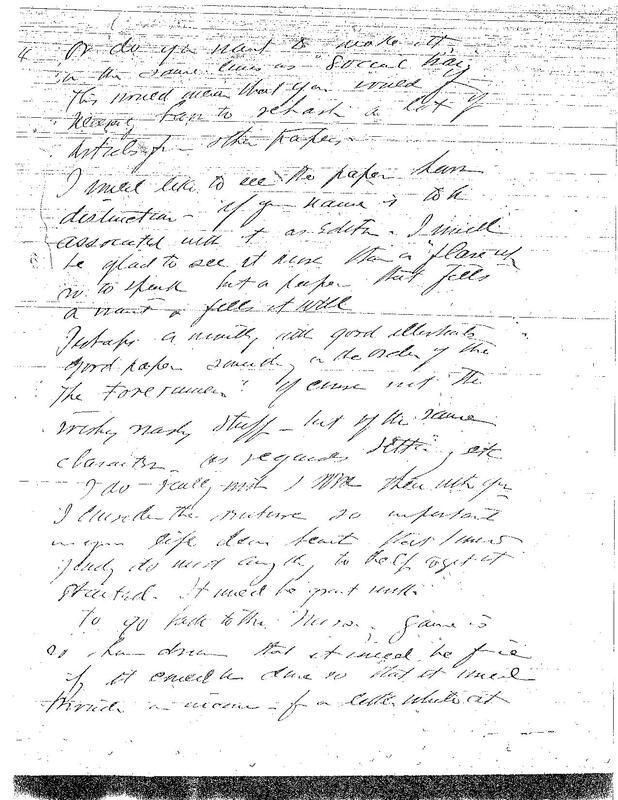 Although the letter from Sanger to which this letter is a response has not been found, it is clear that Sanger blamed herself for Peggy’s death and deeply mourned the loss of her daughter. Ive always said since Peggys death that life could not hold me long if another of my children went before I do — I still feel that way. The first page of the first issue of Woman Rebel. To look the world in the face with a go-to-hell look in the eyes; to have an idea; to speak and act in defiance of convention. 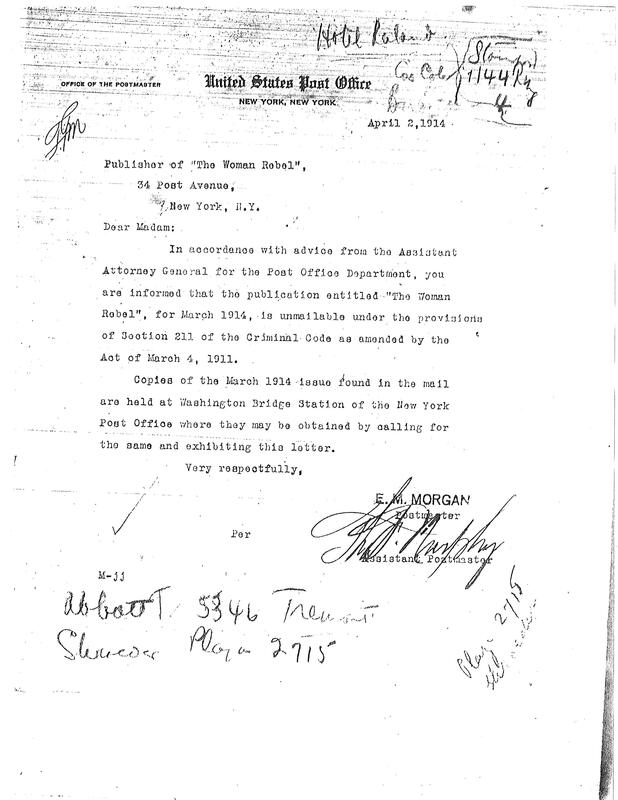 Dear Madam: In accordance with the advice from the Assistant Attorney General for the Post Office Department, you are informed that the publication entitled “The Woman Rebel”, for March 1914, is unmailable under the provisions of Section 211 of the Criminal Code as amended by the Act of March 4, 1911. The letter from the postmaster stating that Woman Rebel was unmailable. Nevertheless, Sanger decided to continue publishing and attempting to mail Woman Rebel, and this led to her indictment. When she learned that she was likely to receive the severest sentence possible if found guilty, she fled the country for England in November, where she remained until October of 1915. The trial was eventually scheduled to begin on January 18, 1916, but was postponed several times for various reasons. Ultimately, the case ended a month later, on February 18, when it was dismissed by the United States District Court of New York. The story of Woman Rebel is only partially illustrated by the events that occurred after its publication, however. Sanger’s Autobiography provides one window on the start of the paper. She says that the idea came to her on the ship back to New York from Paris on New Year’s Eve, the idea “of a magazine to be called the Woman Rebel, dedicated to the interests of working women.” Sanger was conscious that she had to limit the paper to claims on which she could follow through. One of the primary concerns was, of course, money, but moral support was also an issue. The feminists, led by Charlotte Perkins Gilman, provided neither, but the socialists and trade union organizations turned out to be more helpful in terms of support and subscriptions. Often I had thought of Vashti as the first woman rebel in history… I wanted each woman to be a rebellious Vashti, not an Esther. now dear love its great that you are going to start that paper… Now I think we ought to make the paper have an international character — Im going to work Victor Dave to write a short article and the leading women agitation here you know. I can reach Miss Pankhurst going to try & get her too — You ought to have the England exchanges — that is all the English sufferget radical & Red Papers to keep — touch — I shall write at once to get them & will forward as soon as I receive them… perhaps I can act as your Paris correspondant how often will the paper come out. William Sanger’s letter from February 14, 1914, using the name Woman Rebel to refer to the project. I am particularly anxious that you get the Exchanges in all the English Radical & Revolutionary papers, that is you to send on the Woman Rebel & they will exchange theirs. This will keep you in touch with the movement in England, the same [?] for France & Germany… I have given the question of the weekly issue of the paper a great deal of thought… the work on getting out a weekly paper now would be too much for you. Why not a semi monthly — this would insure the cooperation of regular correspondents who would be willing to contribute. This will give the paper some class. Especially if the contributors came from England, France, Germany… I would like to see the paper have distinction — if you name is to be associated with it… I will be glad to see it rise than flare up so to speak but a paper that fills a want & fills it well. Perhaps a monthly with good illustrations good paper something on the order of The Forerunner. I was solely responsible for the magazine financially, legally, and morally; I was editor, manager, circulation department, bookkeeper, and I paid the printer’s bill. For more information, see Margaret Sanger’s Autobiography, especially chapter nine, “The Woman Rebel.” Also see William Sanger’s letters to Margaret Sanger, February 5, 8, 14, and 14, 1914.